Why it’s on my TBR? This has been on my TBR list for nearly two years. I remember making the weekly trip to the bookstore and saw it on a table. I read the back cover and it immediately piqued my interest. After finding a spot to investigate whether or not to make the purchase, I read a few pages and decided that it was a must read. I found Picoult’s writing style drew me in. Even though the premise is not new, Picoult breathes new life into it — teenage depression and suicide. However, by the time it was all said and done. I put it back along with a handful of other books. Recently, I was at a used bookstore and happened upon it. How could I pass it up? At $2.00 it went home with me along with about a half dozen other books. For eighteen years the Hartes and the Golds have lived next door to each other, sharing everything from Chinese food to chicken pox to carpool duty. Parents and children alike have been best friends, so it’s no surprise that in high school Chris and Emily’s friendship blossoms into something more. [Then something happens and] no one is ready for the appalling truth: Emily is dead at seventeen from a gunshot wound to the head. There’s a single unspent bullet in the gun that Chris tells police he intended for himself. But a local detective has doubts about the suicide pact that Chris has described. The profound questions faced by the characters in this heart-rending novel are those we can all relate to: How well do we ever really know our children, our friends? What if…? As its chapters unfold, alternating between an idyllic past and an unthinkable present, The Pact paints an indelible portrait of families in anguish… culminating in an astonishingly suspenseful courtroom drama as Chris finds himself on trial for murder. 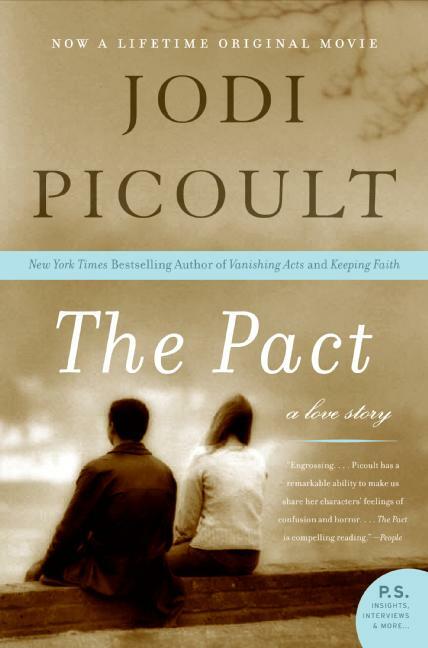 With this riveting psychological drama, Jodi Picoult explores the dynamics of intimate relationships under stress– from the seemingly inexplicable mind of a teenager to the bonds of friendship and marriage. Few writers have such a gift for evoking everyday life coupled with the ability to create a level of dramatic tension that will keep you up reading late into the night. The Pact is storytelling at its best: wonderfully observed, deeply moving, and utterly impossible to put down. ← Which one? Both? Neither? I enjoyed what I read of it. I’m going to have to figure out how to move it to the top of my reading list.